C.J. Newsom’s Classic Country & Comedy, formerly known as Patsy Cline & Friends, is one of the newest shows in Branson which features stars critically-acclaimed vocalist, C.J. Newsom and the Re-Cliners Band along with five-time comedian of the year, Terry Wayne Sanders. These Top Caliber Performers are joined by singer and dancers Michael Frost and Kaylee Ruden of which their talents continue to wow and delight Branson audiences for 6th straight year. C.J. Newsom and her award-winning Re-Cliners Band will bring excitement and joy to Branson stage with their popular songs that were first introduced to the American public. From the sultry vocals of Patsy Cline songs to the high energy, foot-stomping music of Garth Brooks, melodious tunes come alive, thrilling everyone in the audience. Television’s Hee Haw star, comedian Terry Sanders will tickle your funny-bone with his family-friendly slap-stick comedy featuring Joan Rivers, Homer Lee, Gramma Beulah, and more. So, don’t miss to buy your tickets now to get the best seat in the beautifully renovated Americana Theater in Branson and hear all the greatest hits of all time during the days of Patsy Cline. This two-hour entertaining show is not only about the music of Patsy Cline, but of her life and all the people that she influenced. As C.J. Newsom and the Re-Cliners relive the music and life of Patsy Cline, you will hear many of the hits that made her famous, including “Crazy,” “Walkin’ After Midnight,” “Sweet Dream,” “I Fall to Pieces,” “She’s Got You,” and many more. As you watch the show, you don’t just hear the wonderful music of Patsy Cline, but you can also learn about her life beyond music. You’ll be taking an exciting musical journey not only through Patsy’s experiences, but also through the experiences of those that influenced her and those that she influenced, like July Garland, Loretta Lynn, and Reba McEntire. Having performed for over six years with the award-winning “A Tribute to John Denver”, C.J. Newsom and the Re-Cliners Band are very eager to share how Patsy Cline influenced her life and the careers of so many female country singers. Aside from paying tribute to Patsy Cline, C.J. Newsom and the Re-Cliners also bring their energy and charm to other favorite artists such as Dolly Parton, Johnny Cash, and Chuck Berry. You will also be treated to hilarious comedy by five-time comedian of the year awardee, Terry Sanders. Known as king of Branson comedy, Mr. Terry Sanders have delighted millions on televisoin’s “Hee Haw,” and now he keeps folks laughing pretty much in places like clowning around at Silver Dollar City and as comic relief at the Shepherd of the Hills production – also making big laughs in Eureka Springs and showing up as any number of crazy characters at special events, including appearances on the late, great Joan Rivers. C.J. 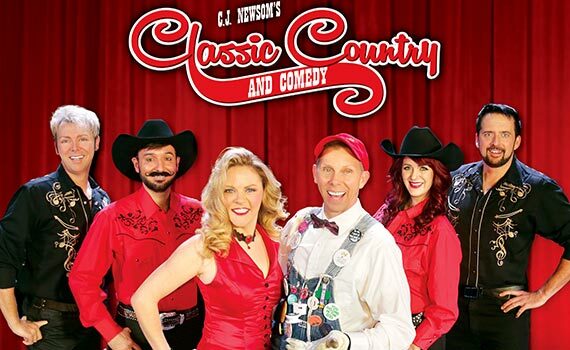 Newsom’s Classic Country & Comedy is one of the shows in Branson that will treat you with a night of singing, dancing, and hilarious comedy from Branson’s top caliber performers.